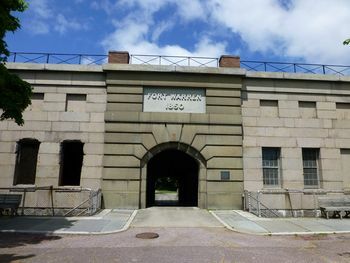 Fort Warren (2) (1847-1947) - Constructed between 1833-1861 and dedicated in 1847 as a Third System Fort. Located on Georges Island at the entrance to Boston Harbor, Suffolk County, Massachusetts. Named after Dr. Joseph Warren who was killed at the Battle of Bunker Hill. Decommissioned in 1947. 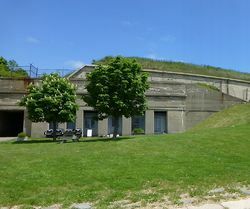 Fort Warren was built from 1833-1861 under the supervision of Col. Sylvanus Thayer and was completed shortly after the beginning of the U.S. Civil War. The fort was built with granite and stone as a pentagon with bastions at each corner. A large ravelin with gun positions covered the ship channels. The walls were two stories tall with large brick vaulted casemates roofs to support the barbette tier. The fort was designed to mount over 200 cannons, including some heavy mortars and flanking howitzers. Most of the armament was emplaced on the barbette tier. Fort Warren was never fully armed. 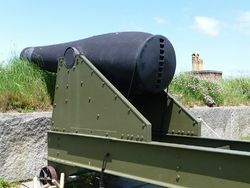 During the U.S. Civil War, it was heavily armed with 10 and 15 inch Rodman cannons, the largest available coastal guns. Union troops first garrisoned the fort in April 1861. During the war, the fort was a training camp for Union recruits and a prisoner-of-war camp for some 2,000 plus captured Confederate personnel and sympathizers. Confederate prisoners were well treated at Fort Warren under Union Colonel Justin Dimick (Cullum 213) who commanded the fort from 1861-1864. Dimick was an army regular officer who had served with some of the Confederate officers during the Mexican War and as a United States Military Academy Cadet and throughout a long military career at posts all over the country. 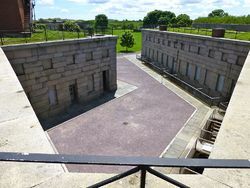 Fort Warren had a prisoner capacity of 175 men but housed at the most some 394 prisoners. There were four prisoners who escaped and twelve prisoner deaths at the fort. Five Endicott Period gun batteries were built into and outside of the old granite fort starting in 1892. The two earliest batteries Battery Bartlett and Battery Adams were among the earliest Endicott Period batteries built and they suffered from the learning curve. Battery Adams proved to be unserviceable early and was abandoned in 1914. Battery Bartlett manage a long life, even though it was built with Rosendale cement instead of Portland cement. By 1902, all of the batteries were complete. 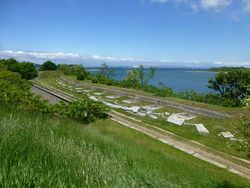 To support the Endicott Period gun batteries George's Island was built out as a small single company coastal defense fort. Construction on the post began in 1899 and continued through 1906. Two sets of officers duplex quarters and two sets of NCO duplex quarters were built along with enlisted barracks. Other major buildings included a hospital and a guardhouse. In 1906 a large steam driven electrical plant was installed as a central electrical plant for the whole island. Also built in 1906 were a torpedo (mine) storage building, two mine cable tanks, and a mining casemate building. 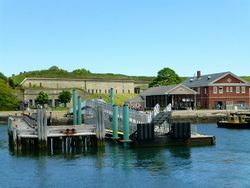 Fort Warren served as a mine control center during World War I, placing, and electrically controlling mines placed on the harbor floor. All four of the gun tubes in Battery Bartlett were dismounted during the war for shipment overseas to the front in Europe. Only two of the guns actually made it to France with the other two in stateside depots. Battery Bartlett remained unarmed until a new set of guns was emplaced in 1919. Battery Plunkett and Battery Lowell were deactivated during the disarmament period in 1920. Boston Harbor Mine Fields. Each triangle represents a group of 19 mines. 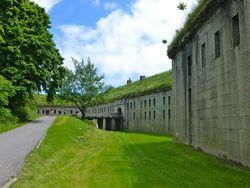 During World War II Fort Warren served as a control center for the south minefield in Boston Harbor and was interconnected with the mine casemates at Fort Strong and Great Brewster Island MR. The mine casemate at Fort Warren had a capacity of ten mine groups, each group consisting of 19 individual mines. 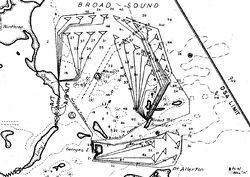 Fort Strong also had a capacity of ten mine groups but the Great Brewster Island mine casemate could control 20 mine groups. Fort Warren actually deployed seven mine groups in the south channel during the war. Deactivated gun battery magazines were used to store the mine explosives which totaled some 1,521,000 pounds of TNT required for Boston Harbor mines. Only two of the five Endicott Period batteries were operational at the beginning of World War II. Battery Bartlett was obsolete at the beginning of the war and, by the end of 1942, it was deactivated and ordered scrapped. Battery Stevenson was also obsolete but was retained until newer batteries were completed, it was deactivated early in 1944. 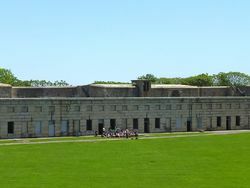 By April 1944, all of the Endicott Period gun batteries were deactivated. 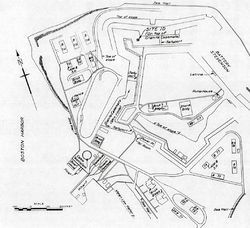 In the build-up to World War II most military bases were expanded and Fort Warren was no exception. Temporary WWII buildings were constructed in 1940-41 and added six, 63 men barracks buildings, two mess halls, and other support buildings. The NCO quarters in the casemates were upgraded from poor condition to fair condition and became habitable again. The additional construction improved the capacity of the fort from 4 NCOs to 28 NCOs and from 378 enlisted men to 665 enlisted men. Officer capacity remained at four. All of the new construction was in place by the end of October 1941, just a month before the start of the war. The capacity figures did not include any tent or hutment quarters which would be used for temporary increases. In 1947, after the end of the war, Fort Warren was permanently decommissioned. The State of Massachusetts obtained possession in 1958 from the U.S. General Services Administration. The fort was opened to the public after initial restoration efforts in 1961. 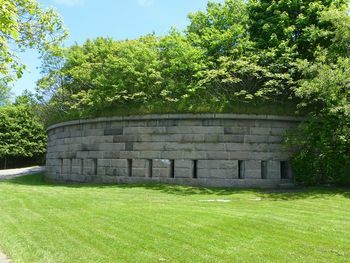 The Massachusetts Department of Conservation and Recreation maintains and administers the fort. Access to the fort is by boat with public boat service provided under a park service contract. Transportation departs from Boston's Long-Wharf and other locations depending on the time of year. Check the park service website for fares and schedule. Parking is very expensive in downtown Boston so use public transportation to get to the pier if possible. Tour boat departs from the pier in back of the Marriot hotel on the Christopher Columbus Waterfront Parkside. This page has been accessed 21,073 times. This page was last modified 14:28, 16 April 2019 by John Stanton. Based on work by Bill Thayer.